The quick recapture of the strategic oil towns of Ras Lanuf and Brega by forces loyal to Muammar Gaddafi has focused attention on the fate of Benghazi, the rebel capital, which lies further up the coastal highway. Military logic argues for Gaddafi to continue pressing his advantage  though realpolitik may now encourage him to keep the killing at a low enough level, with as little visibility as possible, so as not to prick the Western conscience into military action. That would mean forgoing an aerial bombardment of Benghazi that would turn the country's second largest city into a Libyan Guernica  the Basque town that was massively bombed during the Spanish Civil War and became a rallying cry for those opposed to Francisco Franco in Spain and overseas. That kind of indiscriminate killing from the air could finally force Western nations to impose a no-fly zone. At this point, however, such a zone seems largely irrelevant because it would take weeks to implement. There is one major city in the way, Ajdabiyah, which saw one regime plane strike the city of 120,000 three times on Monday morning (one bomb hit a military base and two landed nearby). A few people were reported injured at the base. No one was killed. Still, military analysts say the regime probably doesn't need airpower to capture Ajdabiyah as Gaddafi is quite capable of shelling defiant cities into submission, as demonstrated in Ras Lanuf and Brega. Meanwhile, Gaddafi's forces are somewhere between Brega and Ajdabiyah, but they are not giving any evidence of pushing forward at any quick pace. There were, however, reports of military reinforcements streaming eastward from the large garrison in Sert, Gaddafi's hometown. Once Ajdabiyah is out of the way, Gaddafi could launch an all-out assault on Benghazi, says Andrew McGregor, an expert on the Libyan military with the Jamestown Foundation. Gaddafi could lay siege to the place, cut off basic services and pulverize the city with artillery and rockets, suppressing the other side's ability to resist under the weight of the bombardment, and then send in armor and infantry  and they'd do the rest. That, however, runs the risk of generating TV images of gruesome suffering that might force Western policymakers to intervene. But not everyone is convinced that Gaddafi will press on to Benghazi. He could very well just take Ajdabiyah and gain access to a route that would go around Benghazi and take Tobruk, a city near the Egyptian border, effectively encircling the rebellion. "If Gaddafi gets 90% of what he wants under a partition scheme, why put that all at risk for the additional 10%  that's the rational thing to do; it's cost and benefit," says Steven Simon, a former National Security Council staffer now at the Council on Foreign Relations. Simon says he can envision Libya being split like Iraq was under Saddam Hussein, with the Kurdish region effectively separated from the Baghdad regime for years before the tyrant was finally toppled by the 2003 U.S. invasion. By recapturing key oil facilities  which the regime is already trying to bring back online  Gaddafi has buttressed his own political legitimacy and undermined the economic viability of any remaining rump state. "If he just accepts partition, the scope and the impetus for foreign intervention dissipates," argues Simon. Already, control of Brega gives Gaddafi control of the natural gas that fuels Benghazi's electricity-generating plant, notes McGregor. One of the most remarkable aspects of the rebellion is the utter lack of military leadership demonstrated by the roughly half a dozen senior officers who defected from Gaddafi  as well as the almost complete absence of the 12,000 troops in the east who laid down their arms at the beginning of the uprising. The most visible rebel fighters were volunteers, citizen guerrillas who took their own weapons, many raided from police and army depots, into battle and had to learn to man heavy weaponry on the job. If anything, the military officers seem to have devoted themselves more to political maneuvering than prudently preparing for the defense of the uprising. 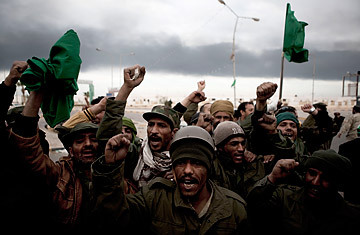 "This is basically how all revolutions turn out  revolutions never belong to the people that fight them, they belong to the people who manage to exploit the situation towards their own interest  and Libya is no different in that regard," says McGregor. General Abdel Fattah Younes, Gaddafi's former Interior Minister turned rebel army chief of staff, insists that the rebels' falling back from Ras Lanuf and Brega is a strategy. "War is a matter of advance and tactical withdrawal," he said. "What we are trying to do is lure [Gaddafi] into an area where we can even the fight." Others are skeptical. Says McGregor: "I am not sure how a headlong tactical retreat to a town [Benghazi] that's about to be surrounded, has no defenses, has lost its ammunition dump and is about to have its power cut off is going to save the revolution." If or when Benghazi is under immediate threat, the West is going to face stark options. "This is going to be very embarrassing for the Western countries who have demanded Gaddafi step down or have said they are 100% behind the rebellion," says McGregor. "What do they do when the rebellion starts to be crushed  are you going to watch or are you going to intervene militarily? Those are the basic choices you are going to be left with if Gaddafi's forces reach Benghazi, and that will be a decisive battle and that will be a decisive time for the foreign policy of Western countries  they will have to make a rather quick decision." France, so far the only country to recognize the rebels' National Transition Council as Libya's legitimate government, will be particularly on the spot. "Does [French President Nicolas] Sarkozy take the political hit or send in the Special Forces?" asks McGregor. Or will everyone just watch as the most dramatic revolt in the Middle East's Arab awakening is brutally crushed? See TIME's complete coverage in "The Middle East in Revolt."